Holiday shopping is right around the corner. As you approach each checkout counter, you’ll be faced with this question again and again, “Would you like to save an additional 15% when you apply for a credit card?” Saving is always a great thing. However, is applying for department store credit cards the best way to save or do you end up paying for it in the end? 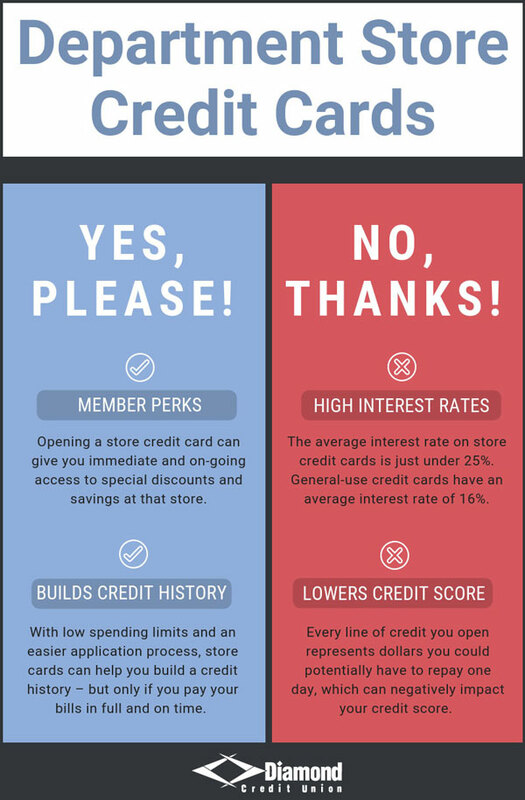 It’s not all bad news when it comes to store credit cards. There are a few scenarios where they are beneficial. If you open a store credit card with a retailer you shop at often, you can quickly earn additional discounts, grow loyalty points, or receive early alerts to store sales. This is a good way to save on future purchases or to save up for a larger purchase. However, continued alerts of sales and discounts may entice you to make purchases that are not necessary. If you are trying to build credit, a store credit card can be a beneficial tool. Store cards have a less intense application process and can be easier to obtain than a card issued by a major credit card provider. Additionally, their low spending limits make it harder to rack up large amounts of debt, making repayment easier. A history of consistently paying off your entire balance, on time, further strengthens your credit status. While there are a few “pros” to store cards, the drawbacks can be even greater. Far outweighing the membership perks and discounts, high interest rates and damage to your credit score are more costly. Probably the biggest drawback of a department store card is the incredibly high interest rates they charge. The interest rates on retail store cards continues to grow and the average interest rate is now just under 25%. In comparison, the average interest rate on a general-purpose credit card is in the mid-teens. Oftentimes stores will employ a “no interest for 12 months” promotion to further encourage enrollment. But if you have not paid off your card balance by the end of the 12-month period, you’ll be strapped with large monthly payments once the interest kicks in. If you don’t have the ability to pay off your total balance each month, you shouldn’t open a store credit card. While retailer specific credit cards can be one tool to build credit, in many cases they can have a negative impact on your credit. Credit scores are measured not only on the amount of debt you have, but also the amount of debt you can potentially amass. So every line of credit you open represents dollars you may potentially have to repay one day and can negatively impact your credit score. Additionally, you should not apply for a new card if you have hopes of purchasing a new home or new car in the near future. New credit accounts are seen as a risk when assessing your credit score and could cause you to pay a higher interest rate on your future loans. Already Have a Department Store Card? Have you given into the temptation of a store credit card in the past? Would you like to relieve yourself of sky-high interest rates? Credit unions often offer great options for improving your credit health. Balance Transfer: You should consider working with your credit union for a balance transfer. Moving your outstanding balance to a lower-interest credit card, such as Diamond Credit Union’s low-rate Mastercard or Mastercard with Rewards, can serve you better in paying off your debts in a timelier manner. Loan Health Check-up: Diamond Credit Union also offers free Loan Health Check-ups to members, where they will meet with you to review your credit report and discuss how your credit cards are impacting your financial health. Take control of your credit before your credit controls you.